untiring efforts over those many years that led to this definitive publication. Also to be congratulated are Ian Williamson, the Chair of FIG Commission 7 at that time as well as the FIG Council presided by Peter Dale. CADASTRE 2014 represents not just ideas and concepts, but passion and abilities to better comprehend and apply evolving cadastral concepts. the potential of what “Land” is; by “Land” we also mean the seas and its natural resources, for the well-being and betterment of humanity. Our profession is tempted to look at our past and present achievements, but foresight is about considering the challenges of the future, the evolving contribution and relevance of the cadastre towards the “World We Want”. It is most fitting that at the silver jubilee Congress of FIG to be held in Kuala Lumpur, Malaysia this year with the theme “Engaging the Challenge: Enhancing the Relevance” that we celebrate the immense success of CADASTRE 2014 Vision and launch this new publication on “CADASTRE 2014 and Beyond”. We congratulate all contributors and in particular, Daniel Steudler, the editor for all their efforts towards this publication. We extend our deep appreciation and gratitude to our Membership and the corps of volunteers within our Federation for their invaluable and unselfish contributions in this publication and its related endeavours. CADASTRE 2014 has been published in 1998 as a result of a working group of FIG Commission 7. 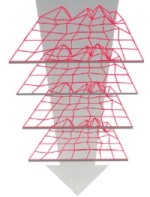 The working group, active from 1994–1998, had the mandate to identify trends in the cadastral field and to suggest whereto the cadastre might go for the next 20 years. The working group carried out two questionnaires in order to identify the trends and came up with six vision statements, provocative for some, innovative for others. The publication presented and explained those six vision statements, suggested some new definitions in order to make the visions possible, and also made some recommendations for action. As the year 2014 has arrived, it is very appropriate to take the topic up once more, to review the statements, to evaluate them and to put them in context. The XXV FIG Congress taking place in June 2014 is an excellent opportunity to do that: two special sessions are part of the congress program and the sections included in this publication will be presented and discussed. 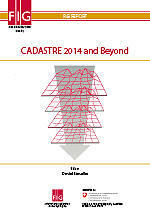 Front cover: The Cadastre 2014 graphic by Werbegraphik Bruno Teucher, Rüdlingen, Switzerland. © Jürg Kaufmann and Daniel Steudler.